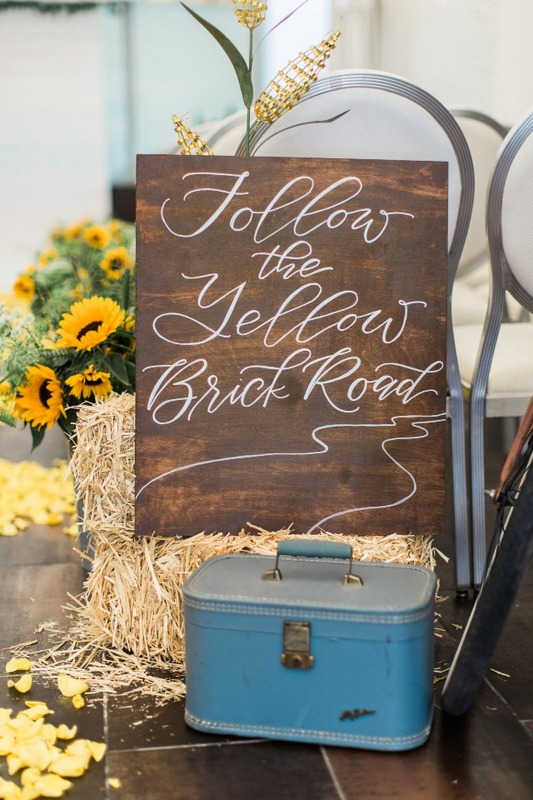 Follow the yellow brick road? 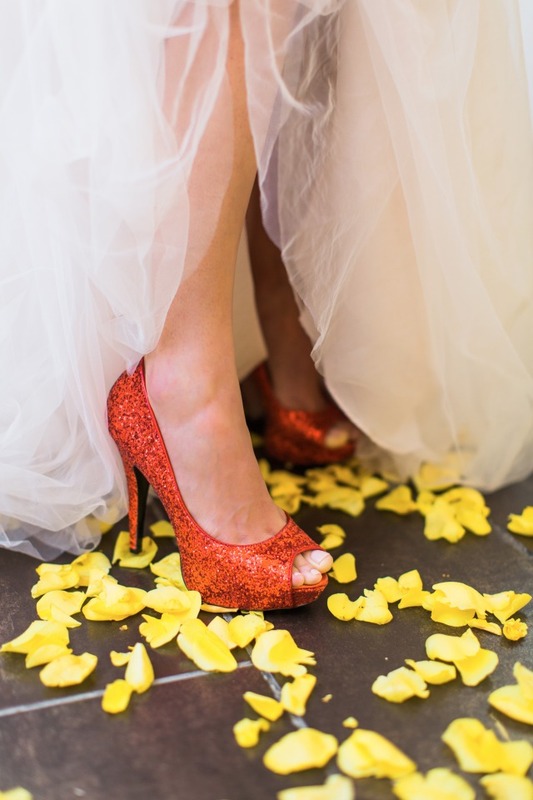 Follow the yellow brick road? 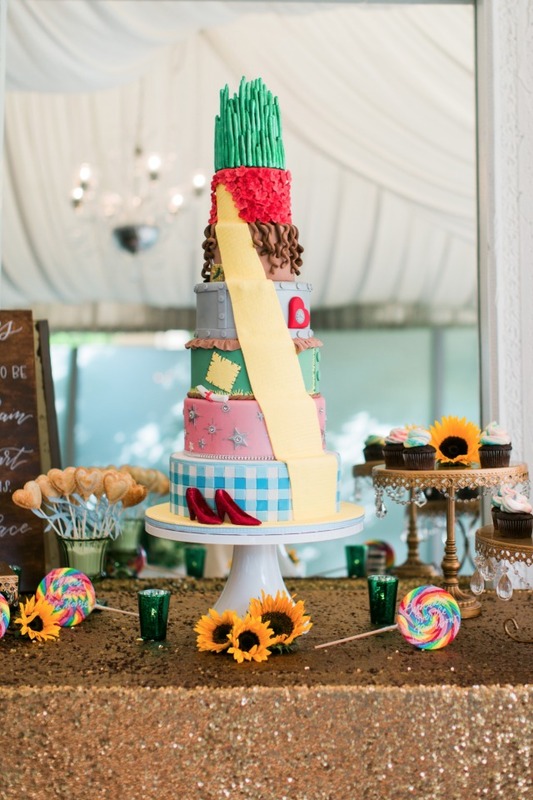 Follow the yellow brick road! 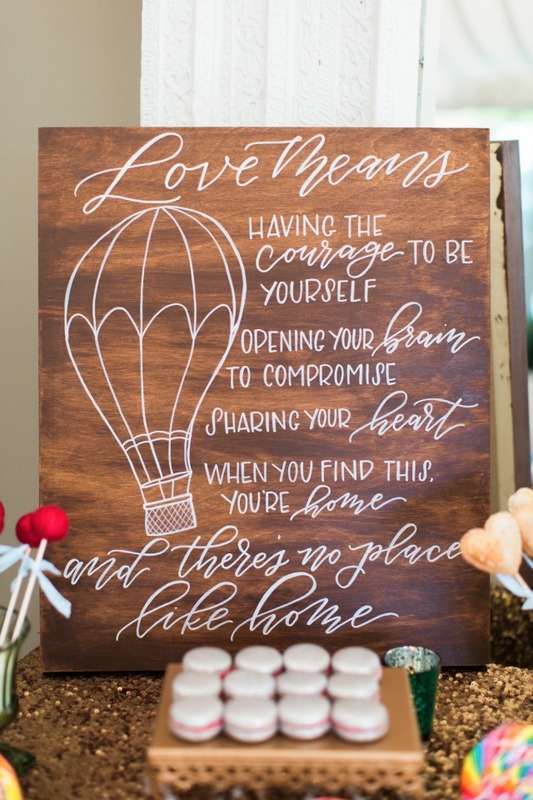 Follow it down the aisle to the man of your dreams in this Wizard of Oz themed inspiration brought to you by Fandom Affairs. 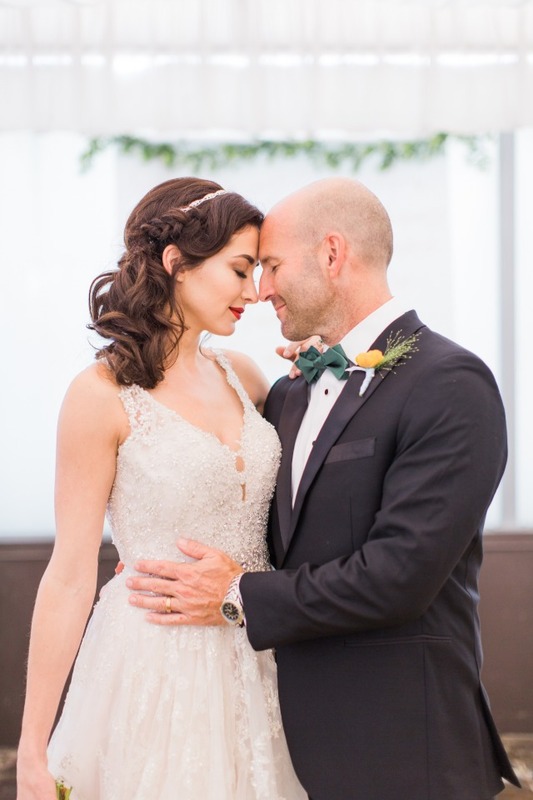 If you love Oz and all that magical land has to offer you are going to LOVE this shoot! 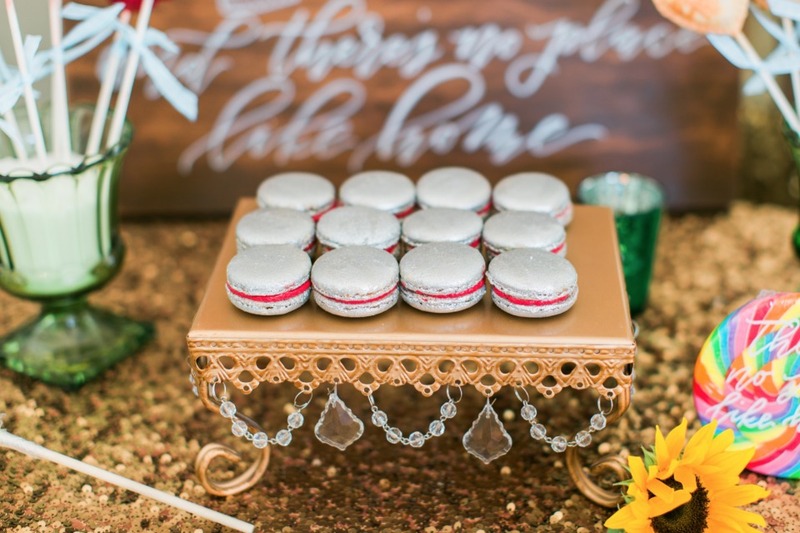 From the glam ruby slippers to the Emerald City inspired reception table and just wait until you see the cake! 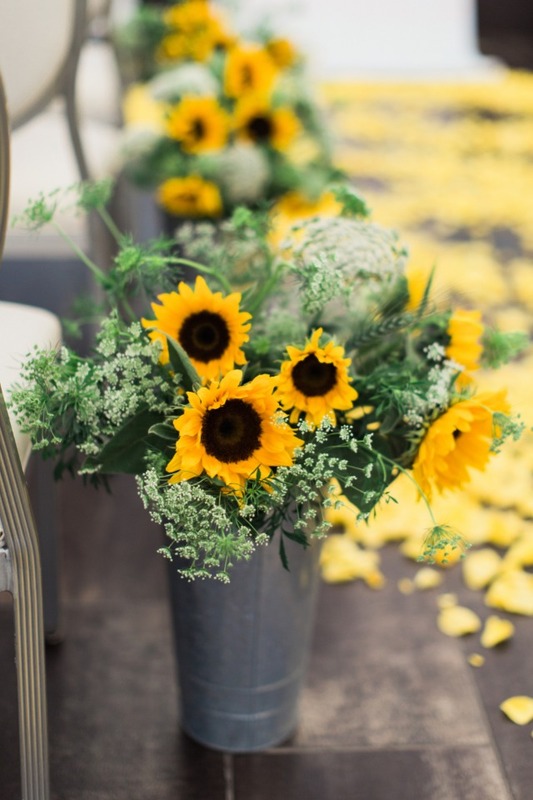 Keep scrolling to see more and don't forget to visit the full gallery to see it all, thanks to Laura Ford Photos! 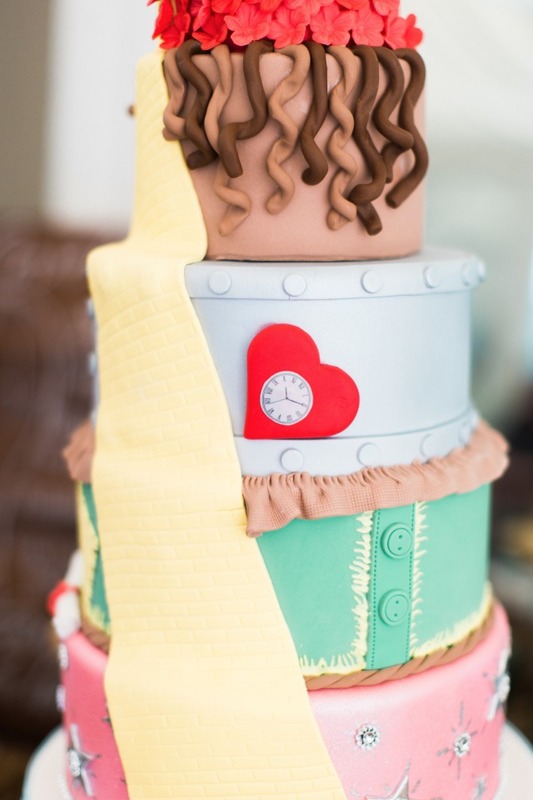 From Fandom Affairs: For this styled shoot we were inspired to travel to the land of Oz! 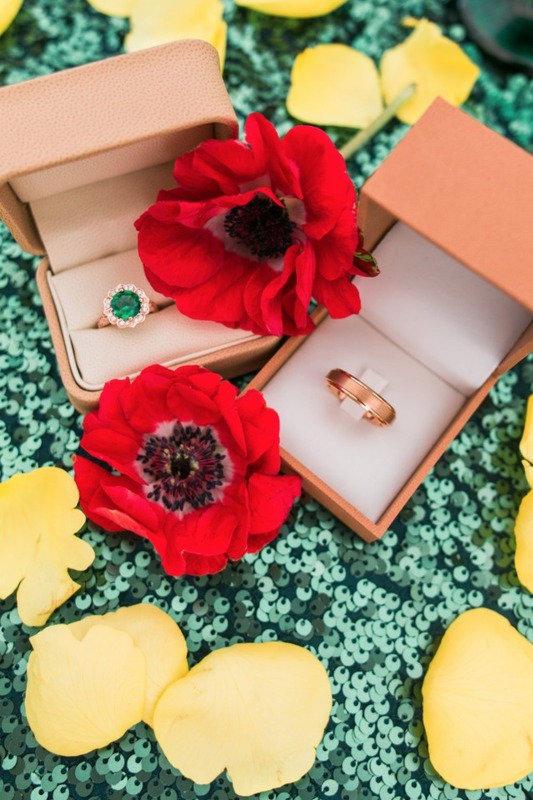 The ceremony signifies Dorothy's journey to the Emerald City. 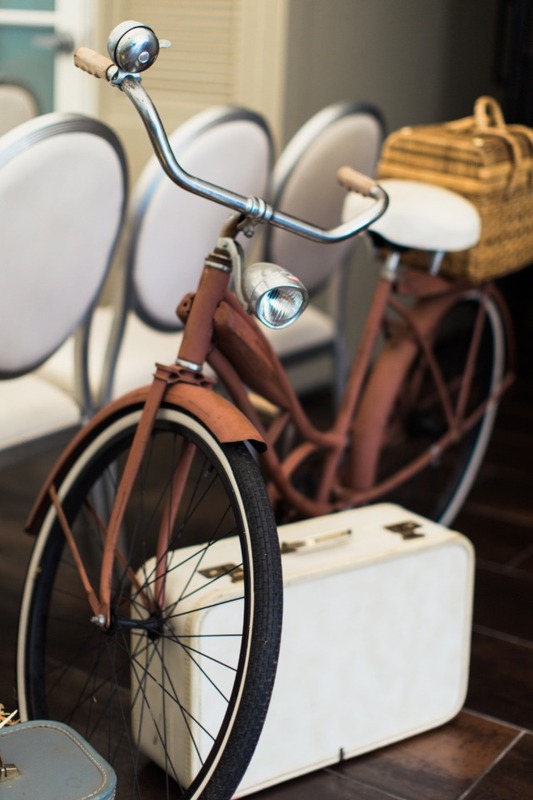 At the top of the aisle we pass Auntie Em's bike and basket along with vintage luggage cases representing Dorothy's beginning. 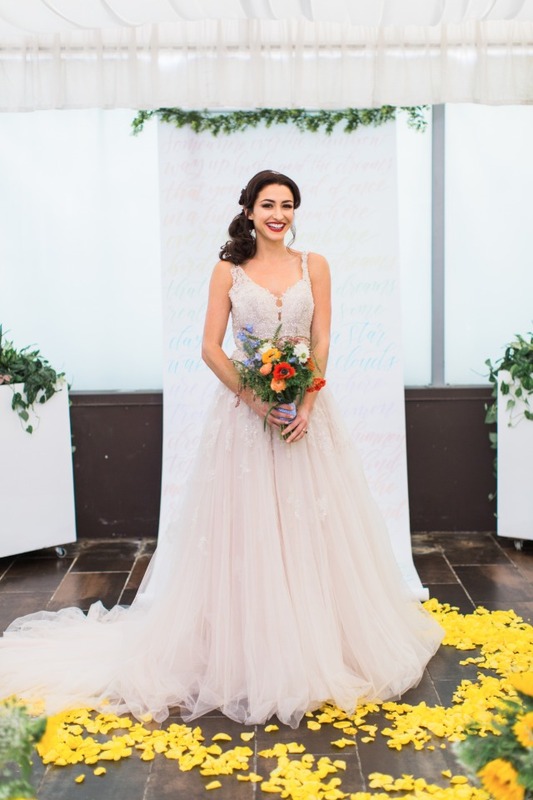 The florals lining the aisle feel like the fields she walked through. 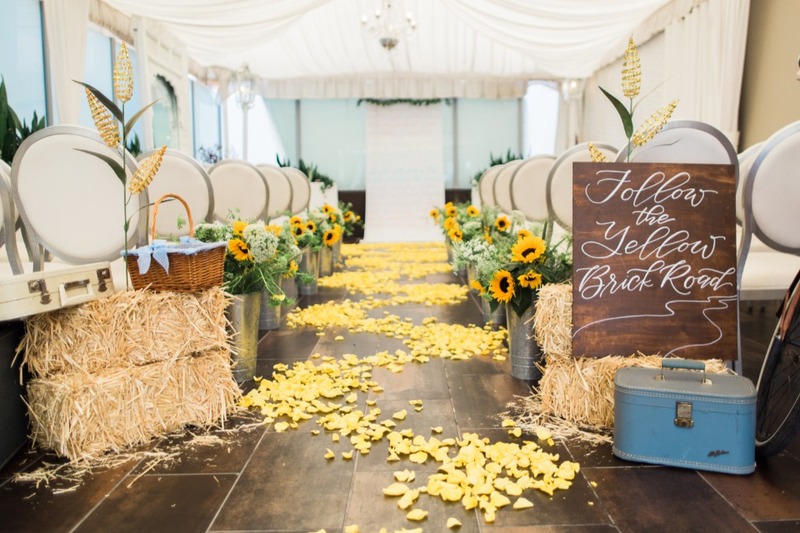 Elements of the Scarecrow and Tin Man are present in the hay bales and tin vases. 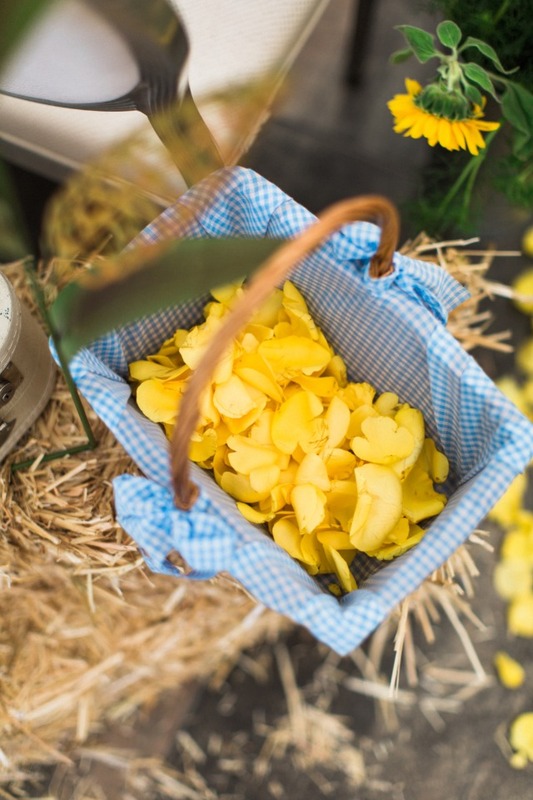 The flower girl basket is lined with blue gingham fabric (Dorothy's fabric) and of course the bride can follow the yellow brick road flower petals to the altar. 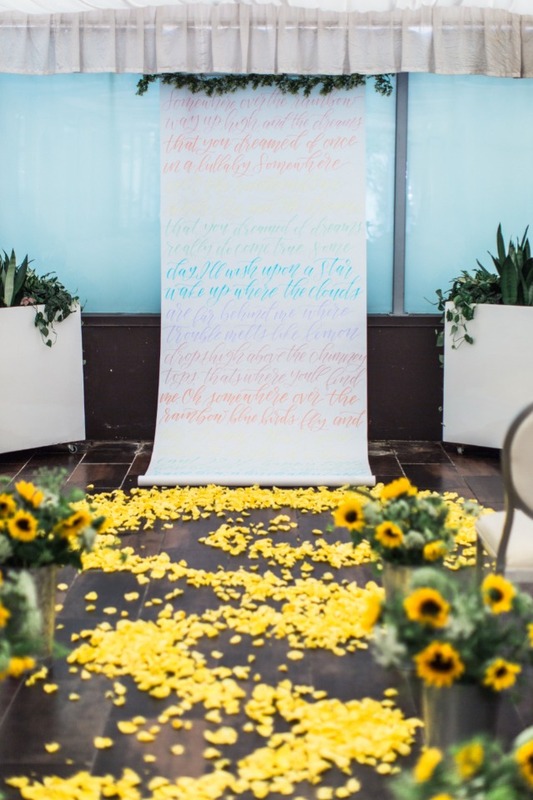 The focal point of the altar is a four foot wide scroll adorned with the lyrics of "Somewhere Over the Rainbow" written in rainbow pastel calligraphy. 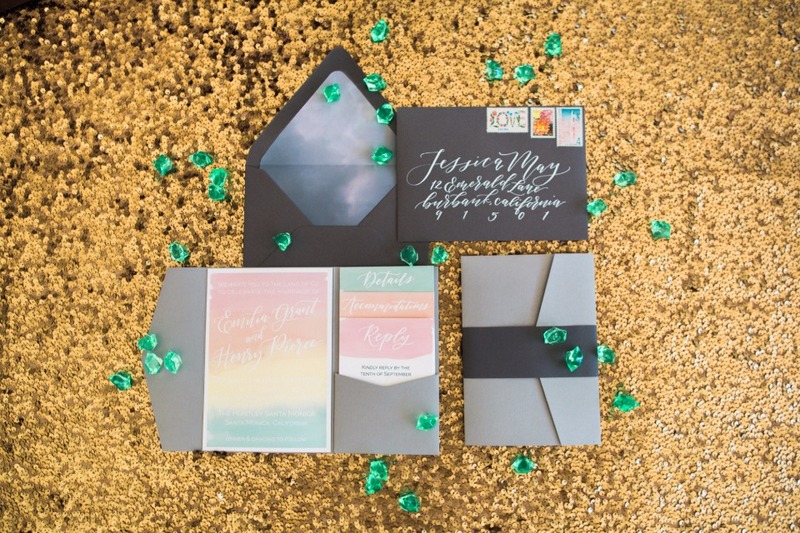 The use of gray and black on the envelope and cover of the beautiful invitation suite is reminiscent to the opening scenes in the film The Wizard of Oz. 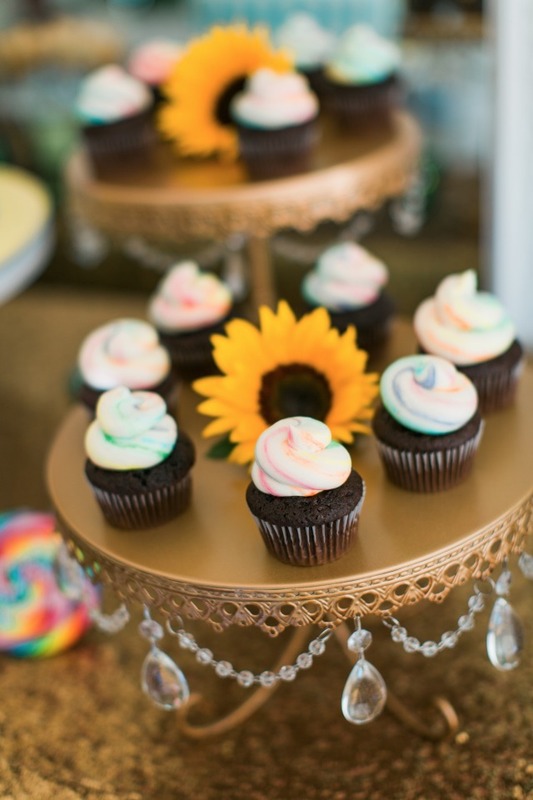 Once you open the invitation you enter the colorful land of Oz with soft pastels. 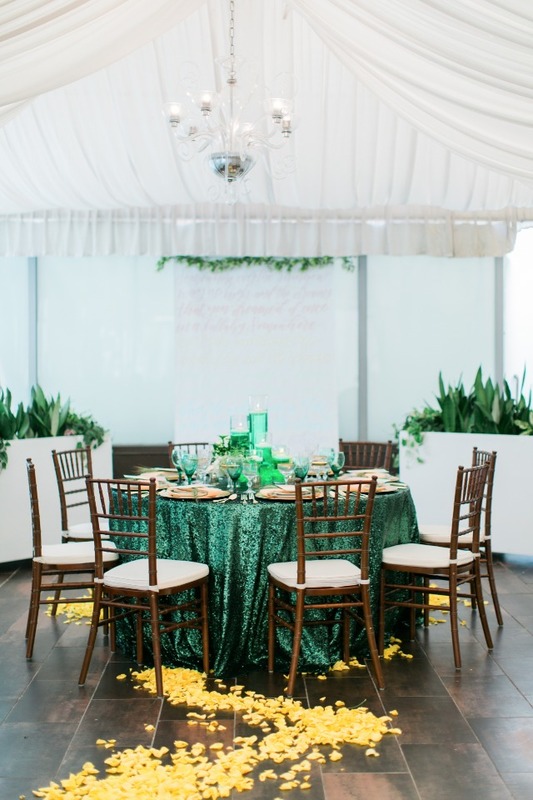 Next, we transition to the reception tablescape. 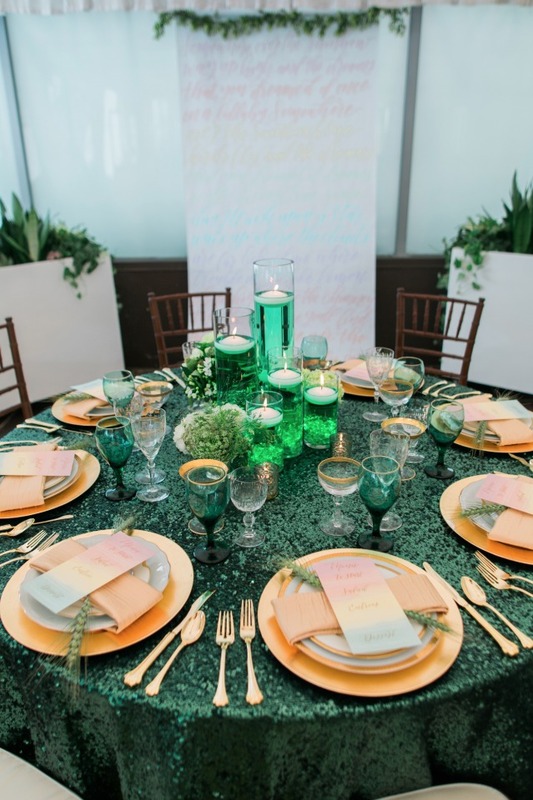 Dorothy has arrived to the Emerald City and like the Emerald City our guest table is embellished with green! 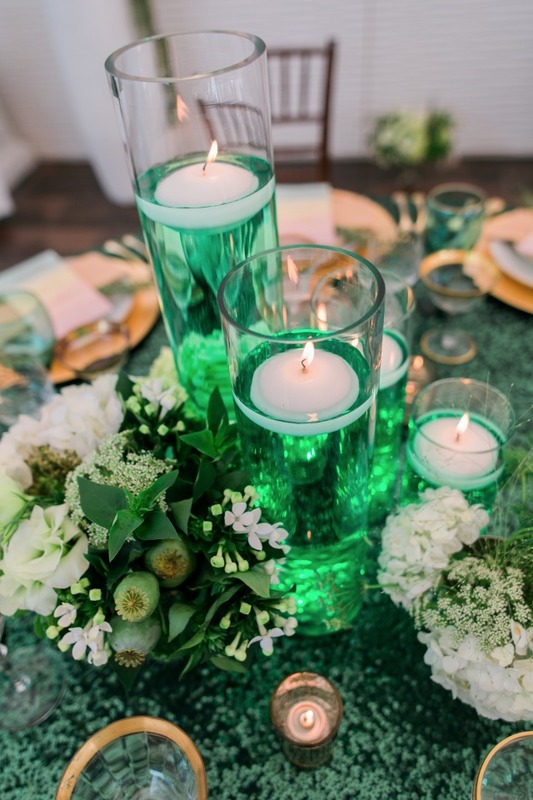 The centerpiece mimics the pillars of the Emerald City Palace. 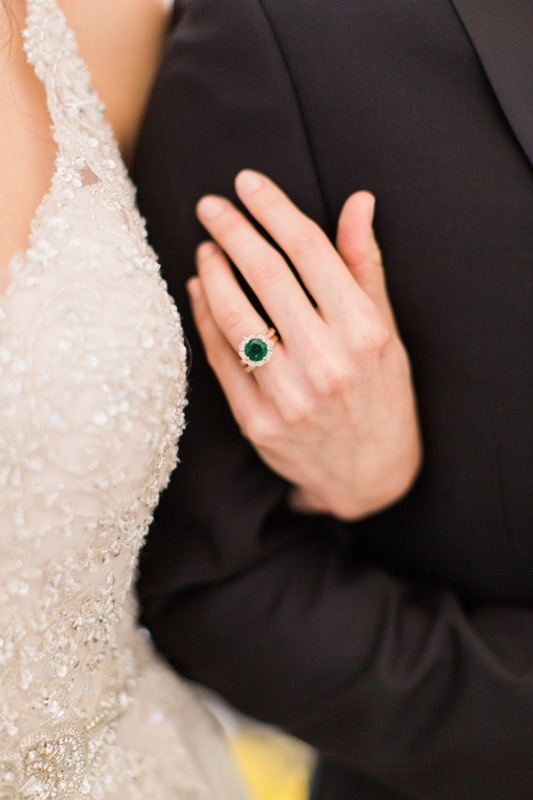 Fabulous emerald sequin linens and stemware are accented with gold china, napkins, and flatware. 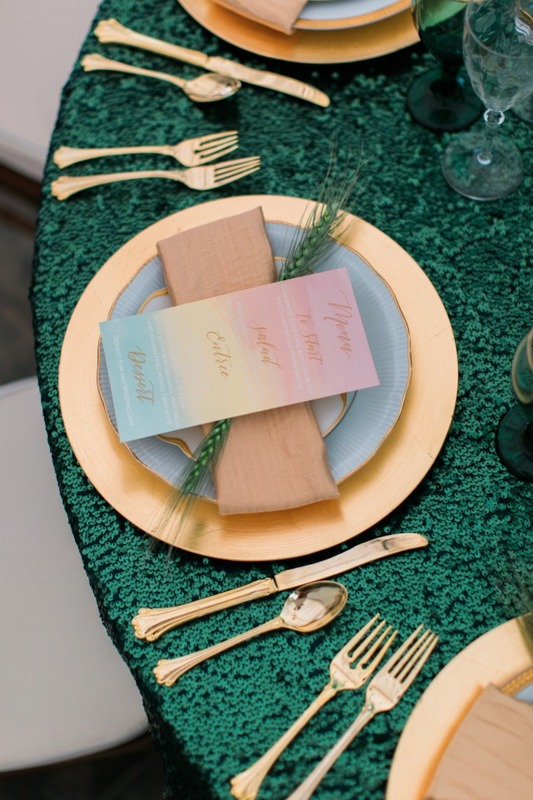 The menus echo the invitation with rainbow pastels and a sprig of wheat subtly ties in Kansas into the place settings. 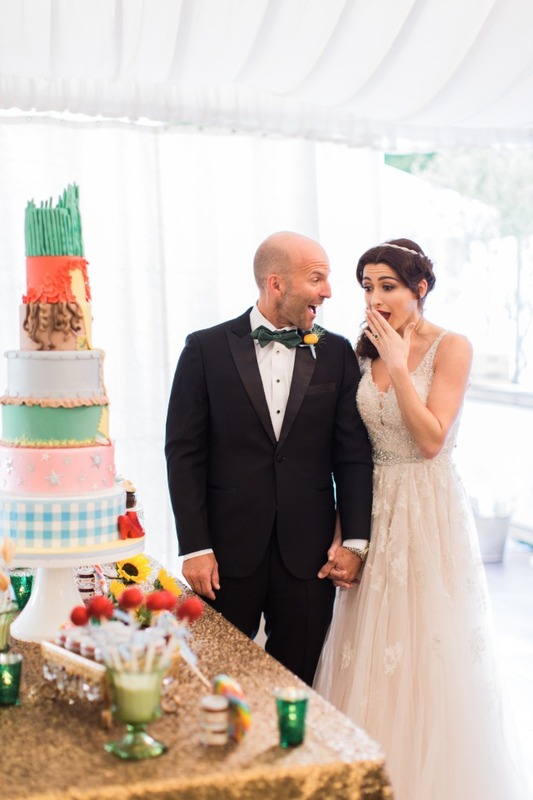 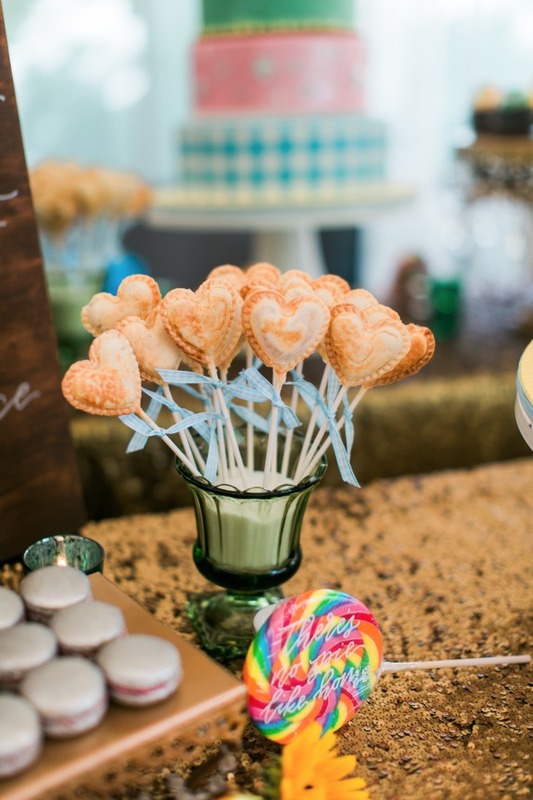 You can see even more fun Oz inspiration by visiting these Wizard of Oz Wedding Ideas!